As an artist-in-residence at Hopkins Marine Station, Alex created a suite of illustrations to help communicate the research of the Goldbogen Lab. Jeremy Goldbogen, along with his killer team of grad students and post-docs, studies filter-feeders, from the 15-cm long northern anchovy (Engraulis mordax) to the 25 m blue whale (Balaenoptera musculus). Using cutting edge technology, the lab collects data on how whales behave and maneuver underwater, revolutionizing the study of these elusive creatures. Manufactured by Customized Animal Tracking Solutions (CATS), this tag is stuck onto a whale with suction cups, deployed from a small boat with a 20-ft pole. With HD video recording, and sensors for light, acceleration, pressure, direction, gyroscope, and more, these tags are revolutionizing the world of marine mammal science. This suite of digital illustrations was created in Adobe Illustrator and Photoshop. Echosounders employ sonar technology to measure physical and biological features underwater—specifically, they are used by researchers in the Goldbogen Lab to map out the presence of krill and fish patches that whales prey upon. This custom-built echosounder system is completely self-contained, with a pelican for the transceivers & batteries and a pole mount for the transducers, allowing for easy set-up and use on board. Despite being the largest animals on earth, blue whale feed primarily on tiny krill, which average 2 inches in length. Alex created an animation to describe a newly documented feeding behavior, where the blue whale rotates 180° prior to lunging through a patch of krill. Humpbacks are incredibly well-adapted generalist foragers, capable of employing a wide variety of feeding techniques, depending on the type of prey they are pursuing and how that prey is reacting. These are just a handful of their feeding behaviors, all of which Alex illustrated for an upcoming publication. 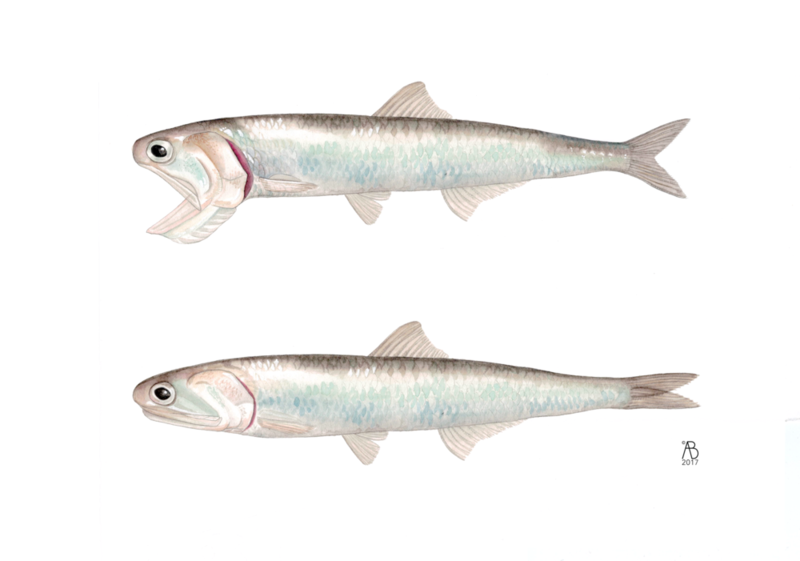 Northern anchovies (Engraulis mordax) and pacific sardines (Sardinops sagax) are both crucial to the Monterey Bay oceanic food web, serving as prey for many species of fish, bird, and marine mammals. However, the two species respond differenctly to oceanic conditions, and their abundance in the Monterey Bay area appear to be inversely correlated. These illustrations were created for an upcoming publication, focused on comparing the feeding mechanisms of these two species.